The Princess has landed. Or something. We enjoyed delightful times with our houseguest and are now returned to our standard workday with a tad more time for sharing wacky and whimsical things in our goofy blog. Wondering just what one does with snappy items like these? Ms. Howard also has other fun figures memorialized in this fashion, including Karl Lagerfeld and Hillary Clinton. Some readers may recognize the unmistakable style of our next item, knowing immediately they are by Hidalgo. 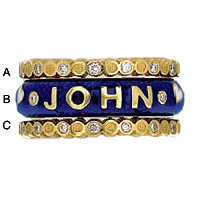 The stacked rings with candidate names carry the distinctive look the company is famous for; the Obama and McCain rings are each about $1350, while the gold and diamond ring guards shown above will add another $1,100 to $1,260. If you are looking for something a little less dated, you can play it safe and go for one simply showing your fundamental belief on the issue. Both the Elephant and Donkey are $1100, the red enamel guards shown with them run about $475. Of course, the names of vice presidential candidates Sarah Palin and Joe Biden are also available from Hidalgo. For those not familiar with the brand, one can purchase only a single, ‘basic’ ring, or may acquire several. 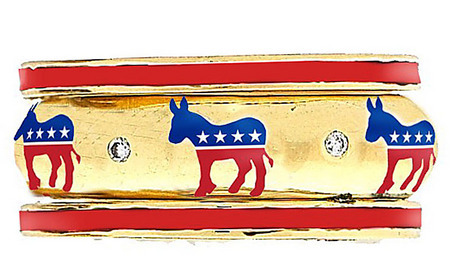 Ring guards (as seen above in red on either side of the Donkey) are fairly essential IOHO, designed to enhance the beauty of that primary ring. 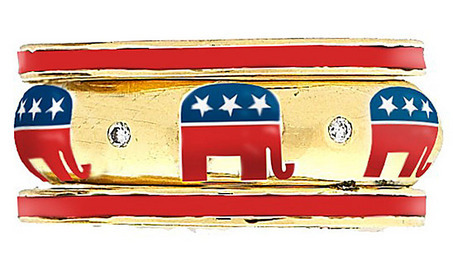 The folks over at StyleList have put together a group of Hidalgo rings they think would be ideal for Cindy McCain. 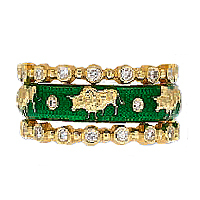 These include a ring bearing John’s name, the ring with her zodiac symbol (Taurus) and one stating the obvious. Next on our political hit parade, one may dine on the candidate of their choice. 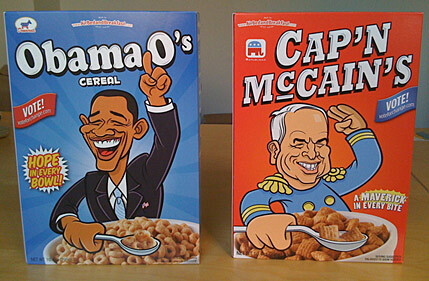 It would seem the folks behind this creation are a bit more acerbic, but also non-partisan. 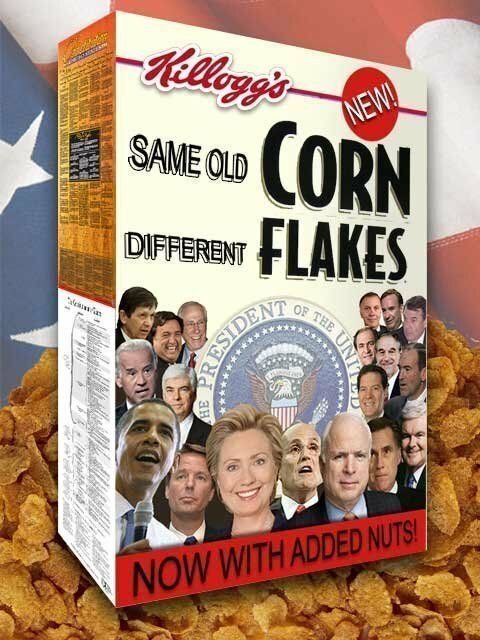 The box features leaders of both parties, adding “Now With Added Nuts.” Indeed. 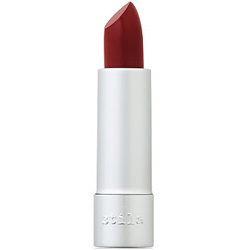 Another non-partisan effort comes via Rock the Vote Red lipstick, available at Stila Cosmetics. 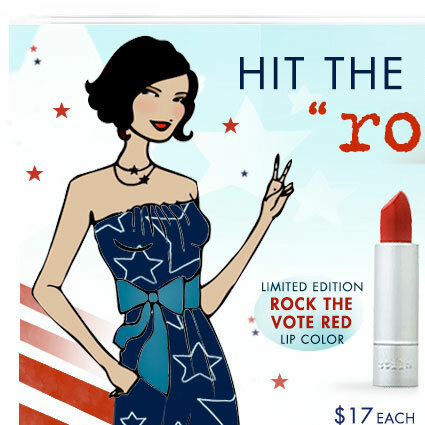 Part of the Rock the Vote, the voter registration effort, the lipstick is a rich red, offered at $17. And finally today, real students at Yale weigh in with their thoughts on last week’s Gossip Girl episode, featuring a trip by the characters to New Haven as part of the school’s admissions process. Below, Serena van der Woodsen (Blake Lively) and Blair Waldorf (Leighton Meester) in the fictitious New Haven. “Students interviewed said last night’s installment of Gossip Girl was especially erroneous in its portrayal of the Yale admissions process. Anyone familiar with either Yale or Columbia immediately recognized that the show was shot at Columbia, conveniently located near other Gossip Girl shoots, with nary a foot of video from New Haven. 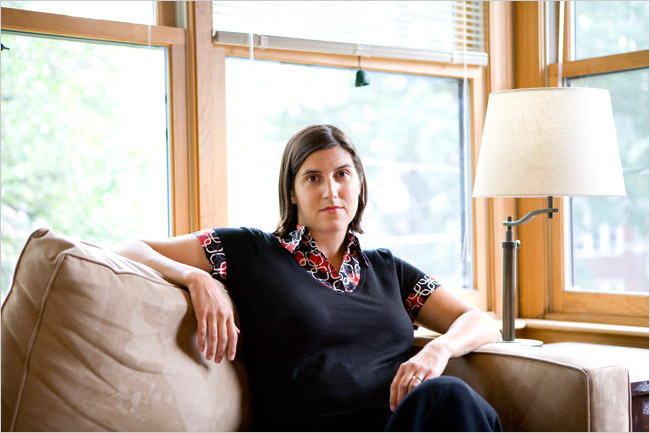 In reality, the Dean of Admissions does not send out exclusive invitations to ritzy early-admissions soirees. Skull and Bones does not tap pre-frosh. And under no circumstances do high school students approach Yale upperclassmen with romantic propositions. Here in the corner condo at the Home Offices of the Preppy Princess Intergalactic (or Interplanetary, either will do) Headquarters, we are most definitely ready for a Friday. My goodness. Sheesh. We are aware it could always be worse – you could be sweltering in Southern California, and we remain hopeful we don’t have a Melted Miss Muffy Martini. (Was it really 106 in Burbank?) Or you could be at the brand-spanking-new Ikea stores that opened this week in Red Hook (Brooklyn) or Atlanta; talk about a zoo! In chatting with friends, it appears both locales have enjoyed scenes not unlike a party at an SAE house or feeding time at the great ape display at your local zoo! Or you could be in Southampton looking at this. We hope you are fortunate enough to be reading this while sitting on the porch at your cottage on Nantucket or at the Cape or Macatawa, perhaps Pismo Beach or Half Moon Bay…. sigh. If you are reading it from the Hamptons, you may have already encountered Gossip Girl filming for their upcoming season. We have never, ever, actually known a human being who would get off the train attired like this. You are in a suit, or you are in khakis and a blazer, or you are wearing jeans and a button down, you know the routine. Three argyles all at once and spectators and the shorts…? No. Not even close. But hey…you’re at the beach. Literally and figuratively. It matters not. By the way, for those not quite in the know (The Princess included) this would be actor Ed Westwick, a Brit who plays a rather slimy fellow named Chuck Bass. 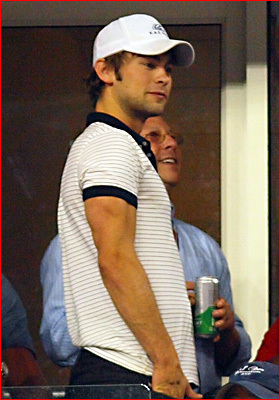 There were other celeb sightings: we were told that any females in the vicinity of actor Chace Crawford tend to swoon, or get a bit giggly, as seen in the photo below. You know, teenage, pre-teen, post-teen, tweens, you name it, almost any female breathing in and out could be susceptible, at least from from what we understand. We move on to female co-stars Blake Lively and Leighton Meester who play teens at the all-girls prep school the show revolves around. Both are seen on the set. One interesting tidbit about the show shooting in the Hamptons comes from Lauren Le Vine’s story in The Cut Blog (New York magazine online): she reports that no one, as in nobody came to the open auditions for the show held at Pink Elephant last weekend. We were told to come “dressed upscale and camera ready,” which had us a little nervous as to whether we’d be up to the competition — but then … there wasn’t any. The massive line of Gucci-clad teenage girls never materialized. Instead, the line maxed out at just four people (including us) and none of us were teenagers. We were amazed. How could only four people want to be on the BEST SHOW EVER? Let’s take a moment to think about this…. would you have gone? We thought not. So we’ll move on to our next topic if that is acceptable to you…? The Princess would like to take a moment for a ‘shout-out’ (… it’s a term we have heard previously and we do hope we have the appropriate usage here) to the folks at Christopher and Banks. The retailer has announced they will provide military personnel a 10% discount every day, starting tomorrow, June 23rd. This is EVERY DAY for active and retired military personnel and their families. How cool is that? Personnel must show a military ID and be in person to receive the discount, which makes sense to TP. Are you familiar with Christopher & Banks? We weren’t, so we were forced to find out more. Above, the evidence. A khaki skirt for about $25 and striped knit tee for $19.97, both of which looked perfectly presentable to us. Above you see the company’s Intarsia Boxes Cardigan at $45.50 accompanied by the Everyday Fit Tee for $15.50. To kick off the military discount, Christopher and Banks and CJ Banks stores will boost the discounts to 20% for a two-week period from June 23rd – July 6th, and make it 30% if personnel bring a friend to the store with them. For more information, TP recommends reading a copy of the snooze release here or contacting a store near you directly. The Princess was amazed to read there are 500+ Christopher and Banks stores (serving Missy sizes 4-16), 250+ CJ Banks stores (serving sizes 14W-24W), and 39 Acorn stores catering to a “… more affluent customer.. a distinct shopping experience for women who prefer upscale, boutique fashions…(sizes 2-16)…for women who seek spirited fashions..” The Princess will not snarkitize the beauty of what the company is doing for the military with any comments about their description of their Acorn stores division.